Deputy Martin was dispatched to Holzer ER in reference to a female possibly being involved in a domestic dispute. After investigation, it was determined it was not a domestic violence incident. Both parties agreed to go their separate ways for the duration of their divorce process. A deputy responded to Lovers Lane in reference to a well-being check. No one was at the residence at the time. Deputies transported two male inmates and one female inmate from various county jails to court and returned them to jail. A female from Flatwoods Road came to the office and reported that she noticed that she had jewelry missing from her residence. An investigation is pending. Deputies transported one male inmate from the Washington County Jail to Marietta Memorial Hospital due to complaints of pain in his arm. After being medically cleared the inmate was transported back to the Washington County Jail. One male inmate was picked up from Noble County Jail and transported to prison to start his prison term. Deputy Martin conducted a traffic stop on U.S. 33 at the rest area. Operator was issued a verbal warning for speed. Deputy Martin was dispatched to an area on Bowles Road in reference to a suspicious female. Once on scene, Deputy Martin identified the female that had been on the property. She was located at a different address on Bowles Road and advised to not return to the initial property. Deputies Leggitt and Martin were dispatched to State Route 733 in reference to a female walking in the roadway. Once on scene, deputies determined her behavior was due to her current mental state. The female was transported to Holzer ER for a mental evaluation. A short time after deputies left, they were dispatched back to Holzer ER due the female being combative with staff. Deputy Martin conducted a traffic stop on a vehicle on State Route 833. The vehicle was unoccupied and off the roadway. Deputy Martin conducted a traffic stop on a vehicle in the Meigs High School parking lot. The driver was just parking there temporarily and was moving along. Deputy Martin was dispatched to Bradbury Road for a well-being check. The female was okay, just home sick and unable to contact her employer. Deputies King and Martin were dispatched to the area of Kingsbury Road to locate a missing female juvenile. Deputy Martin contacted the juvenile’s boyfriend, who advised the juvenile was with her aunt in Gallipolis. Deputy Martin contacted the juvenile and her aunt via the juvenile’s cellular phone. The aunt advised she was only caring for the juvenile until the situation at home calmed down and agreed to bring the juvenile to the Sheriff’s Office to speak with a deputy. Deputy Martin conducted a traffic stop on Nye Avenue at the Exxon station. Deputy Martin issued a verbal warning for defective equipment. Deputies transported three male inmates from different jails to court and then returned them to jail. Deputies Campbell and Leggett were made aware of an individual in the Rutland area wanted on charges out of Dearborn County, Indiana. On patrolling the area, deputies were able to locate the individual, a Jason Snader, and take him into custody on the charge of fugitive from justice. Snader awaits an extradition hearing and is being held at the Meigs County Jail. Deputy Leggett took a report of breaking and entering at an address on Woodyard Road. Suspects entered two buildings and stole multiple items. This case remains under investigation. Deputy Martin conducted a traffic stop on State Route 7 and Tiffany Cemetery Road. The vehicle had a right front flat tire, Deputy Martin changed the tire for the driver. Deputy Martin was dispatched to Eastern Local School in reference to a student who was refusing to go home. After Deputy Martin interviewed the juvenile it was determined the juvenile would require a mental evaluation. Deputy Martin transported the juvenile to O’Bleness Hospital for evaluation. Deputy Leggett transported one male inmate from Noble County Jail for court. Deputy Leggett then transported same male inmate back to the Noble County Jail. The County Garage reported that while they had a vehicle parked on Leading Creek Road over the weekend, someone stole fuel and the batteries from it. Investigation is ongoing. A deputy responded to Pageville Road in reference to an alarm. Everything was found to be okay. No further action taken. A deputy responded to Nelson Road in Rutland in reference to a well-being check. The female was okay. No further action taken. 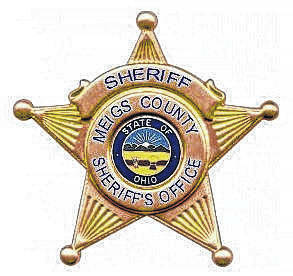 Deputy Martin was advised by Meigs Middle School Administration of a two-vehicle crash in the parking lot. While waiting in the pickup line after school one vehicle didn’t get stopped in time due to a brake issue and struck the rear of the other vehicle. No injuries were reported and only minor damage to both vehicles. The vehicle with brake issues was parked in the school parking lot for repairs. Deputy Leggett responded to a residential alarm on Vance Road. This report was unfounded. No further action. Deputy Leggett responded to Martin Avenue in Rutland due to a report of a domestic disturbance. After speaking with involved parties, the report was unfounded, no further action. A deputy is investigating a complaint that a male subject’s mailbox was damaged on Hysell Run Road earlier that morning. One inmate was transported to a medical appointment and then back to jail. A deputy responded to Darwin Road in reference to an unruly child. The deputy spoke to the juvenile and got the situation worked out. No further action was taken. Deputies issued two concealed carry permits and took in several others application. Deputies transported three male inmates and four female inmates from different jails to court and then returned them to their respective jails. Deputy Leggett responded to a report of theft from a worksite on Kennedy Road near Middleport. Suspects broke into an excavator and caused damage to the worksite, as well as stole multiple batteries from a dozer. This case remains under investigation. Deputy Martin conducted a traffic stop on State Route 7 at State Route 248. Deputy Martin issued a verbal warning for defective equipment. A male from Main Street in Rutland came to the office and advised that someone had taken a firearm from his residence. An investigation is on-going. Deputies served four court papers. A deputy responded to Old Portland Road in reference to a domestic violence. Statements were taken and the suspect, Ronnie Nakao, age 30, was arrested and transported to the Sheriff’s Office to be held until court. Deputies transported two male inmates from the Meigs County Jail to the Monroe County Jail. Deputies issued 16 concealed carry permits. Deputies transported five male inmates from different jails to Meigs County for court then returned them to jail. Deputies transported three female inmates from different jails to court and back to the jails. Deputies transported two male inmates and two female inmates from different jails to court and then back to jail.